Take a listen to the beginning of this song, around 10 seconds into it — there’s an arpeggiator running there that I need to try and duplicate. I tried, Cthulhu but it doesn’t seem to have the octave range that I need. Anyone know of an arp that can sweep 3-4 octaves? If I hold a chord down, can it arpeggiate the notes of that chord through multiple octaves? Use this VSTi. It can play the chord extending to 5 octaves. Does this work on Mac also? Did you try and it is not working? I ended up using a hardware synth to create the arpeggios (over a four octave range) which I then just sampled into Kontakt! Kameleono looks very interesting — it allows for a continuous changing arp pattern — very useful but in order to pull that off you need to feed it MIDI. They imagined you would use this inside a DAW where you can route MIDI from one track to another. I suppose in GP we would need a way to pull in MIDI notes. We might need that new MIDI Player block feature, synched to the play clock. I suppose you could have your DAW running in the background (Ableton Link). I pulled off something like this using BlueARP but it was complicated and I’ve found that plugin to be buggy. 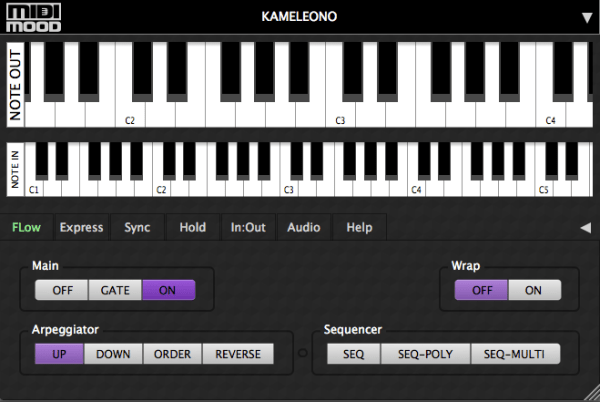 BlueARP has the advantage that you don’t need a separate MIDI stream coming in, but Kameleono has the advantage of being simple and intuitive and ultimately more flexible. In the plugin you can choose patterns, I think it shoul be possible without a need for a DAW. So it should work within Gig Performer. Omnisphere has upgraded their ARP in v 2.6 and you can export the sequence as a MIDI file (that can be further edited) to feed anything. Would this work for you? If only GP had a MIDI file player built in!